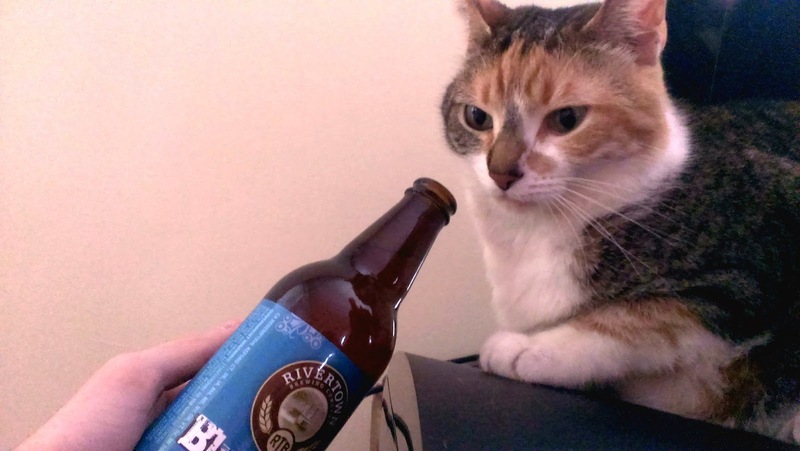 If you'll harken back to a few months ago you'll remember that my very first beer review post on John Likes Beer was for a brew offered by Rivertown Brewing Company, specifically their Pumpkin Ale. 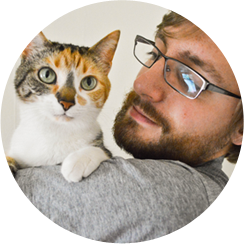 You may also remember that I thoroughly enjoyed it (I rated it at 8.5/10 and Purrl gave it a whopping 9 hiffs). Today I'm discussing my second beer from them: their Blueberry Lager. In January I mentioned that I picked up the sixer of the brewery's Pumpkin Ale for a measly $8.99. Well, I'm pleased to say that RBC's Blueberry Lager is the same price. It's a nice, affordable craft brewery and I like that. I'm currently living on part-time funds so some of the more pricey brews are, at the moment, a bit of a pipe dream for me. Good on you, Rivertown, for giving consumers such a low price. Getting into the brew, I'll say this: I really had no idea what to expect from the bottle I'd just opened. The only blueberry-flavored alcoholic anything I've had before is Woodchuck's summer seasonal. But I knew that, since this is a lager, it probably wouldn't taste like a cider with blueberries in it. I was right. I've always associated lagers with easy drinkability. This was reinforced recently when I attended a beer making seminar and the guy running it said just that. He also said that lagers popularized beer in America. Apparently Budweiser's Superbowl commercial was partially right; some US citizens just want to an easily gulpable beer without any elegance. Heck, I even go for that sort of thing occasionally (never Bud though--I guess I'm too much of a snob for them. They probably wouldn't want my business anyway). RBC's Blueberry Lager, with its 4.3% ABV, seems tailor-made to continue that tradition of easily drinkable brews. I find it taking a quick swig and letting the blueberry remnants linger on my tongue to be a better experience than taking a sip, holding it in my mouth, and attempting to suss out the lager's intricacies. If I do try to pick its flavor apart, though, I'm unimpressed. Remember when I said that Blue Moon's First Peach was less beer and more peach flavor with a watery backing? This is pretty much the same thing, just substitute blueberry for peach. It gives off a very blueberry aroma, which I like. But, I'd like that same aroma a lot more if it wasn't so artificial (I know it's artificial because it says so on the bottle). Purrl seems to think it smell so-so, seeing as how she only gave it four meager sniffs before turning away. I'll admit, the artificialness of it throws me through a loop. I think that I'd be more apt to praise the lager if it used real blueberries in it because, even if that did nothing to improve the flavor, the effort alone would be commendable. As far as my memory is concerned, the lager presents somewhat of a challenge. It's combination of flavor and aroma brings something visual into my head, as opposed to something associated with taste or smell. What I'm visualizing is a slice of white cheesecake with a slathering of purple blueberry sauce on top. I'm tempted to say that it's dining hall desert, which couples well with the dining hall pie memory that was conjured up by my previous RBC experience, although this new one is decidedly less sentimental. 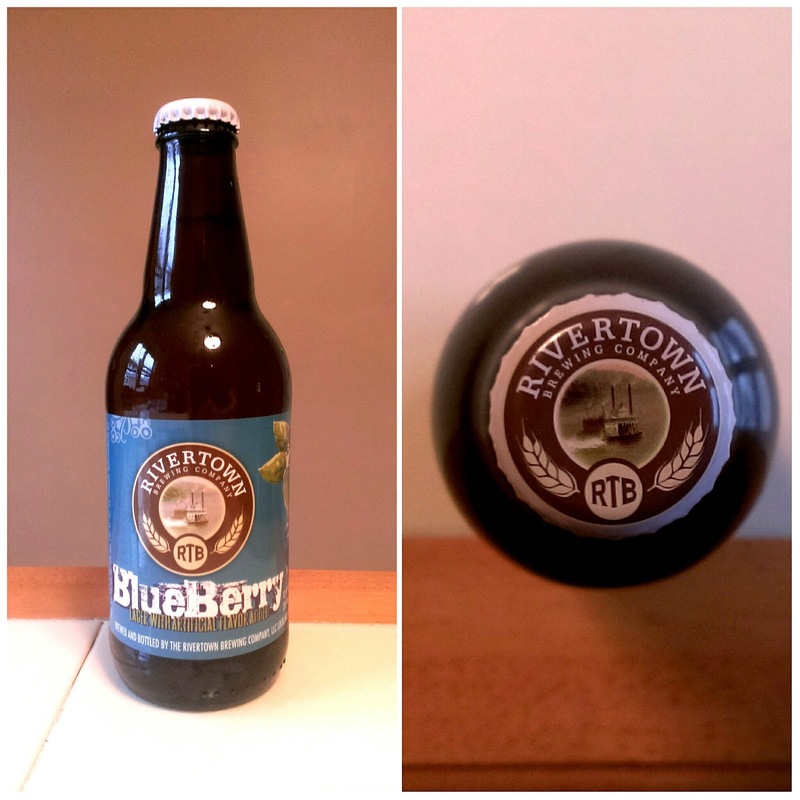 Rivertown Brewing Company's Blueberry Lager has two things going for it: its easy drinkability and its aroma. However, on the whole I'm surprisingly underwhelmed with this beer. As such, it's only getting a 6.0/10 from me. It's not a bad beer by any means but it's also not a very good one, nor is it something I'll likely purchase again.